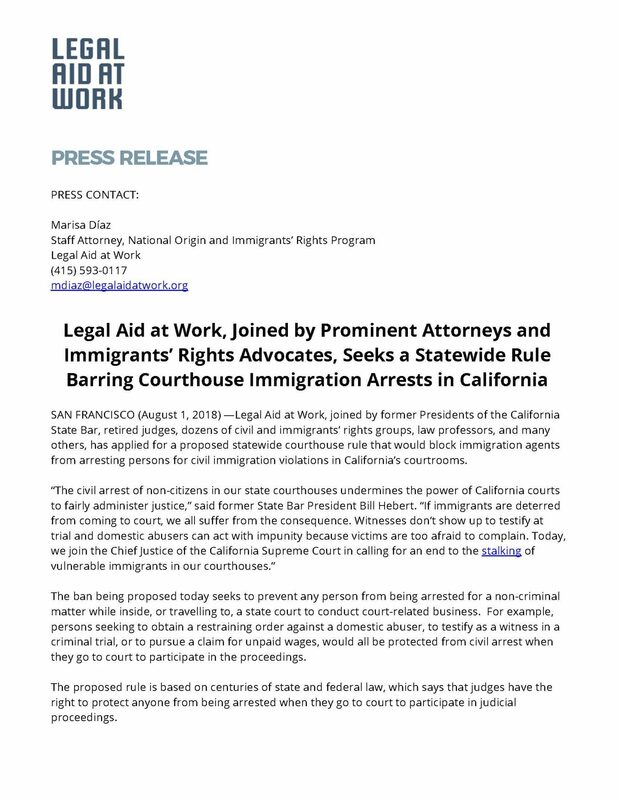 SAN FRANCISCO (August 1, 2018) —Legal Aid at Work, joined by former Presidents of the California State Bar, retired judges, dozens of civil and immigrants’ rights groups, law professors, and many others, has applied for a proposed statewide courthouse rule that would block immigration agents from arresting persons for civil immigration violations in California’s courtrooms. The ban being proposed today seeks to prevent any person from being arrested for a non-criminal matter while inside, or travelling to, a state court to conduct court-related business. 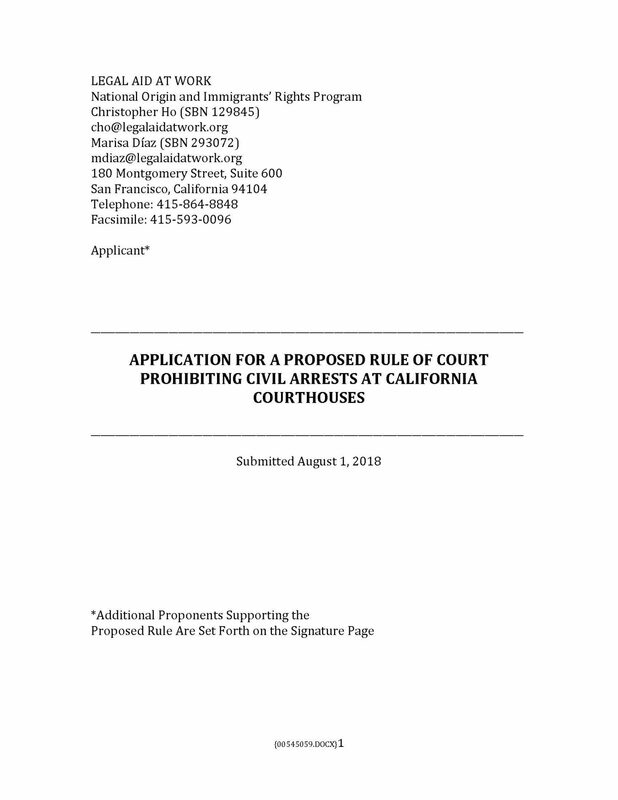 For example, persons seeking to obtain a restraining order against a domestic abuser, to testify as a witness in a criminal trial, or to pursue a claim for unpaid wages, would all be protected from civil arrest when they go to court to participate in the proceedings. The proposed rule is based on centuries of state and federal law, which says that judges have the right to protect anyone from being arrested when they go to court to participate in judicial proceedings. As has been widely reported, the Trump Administration’s policy of using courts to make immigration arrests has already had a profound effect on law enforcement’s ability to investigate and prosecute serious crimes. 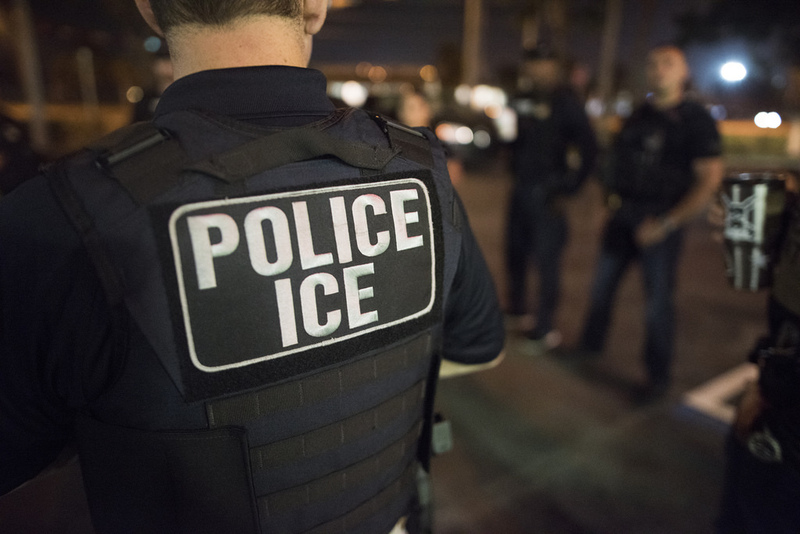 In one recent study, 69% of law enforcement officials reported that domestic violence was harder to investigate because victims and witnesses were simply too intimidated to come forward for fear of the immigration consequences. Similar results were reported concerning other grave crimes, like human trafficking and sexual assault. The full proposed rule can be found here, along with the full list of prominent attorneys, former judges, law professors, civil rights organizations, and others who support its enactment. Additional authorities supporting its adoption can be found here. The Judicial Council of California is expected to consider the proposed rule sometime this fall. Legal Aid at Work is a nonprofit legal services organization that has been assisting low-income, working families for more than 100 years. Its programs conduct outreach, provide direct legal services to thousands of people each year, engage in litigation, and advocate for policies that strengthen the rights of low-income people. More information about Legal Aid at Work can be found at www.legalaidatwork.org. The full proposed rule can be found here, along with the full list of prominent attorneys, former judges, law professors, civil rights organizations, and others who support its enactment.